Hearts captain Alim Ozturk is closing in on a return to action after two months on the sidelines following hernia surgery. The centre-back, who had been playing through the pain barrier in the early months of the season, hasn’t featured since the League Cup win away to Kilmarnock in September. Ozturk returned to the Netherlands for a period of recovery after the operation, but was back in training with his team-mates at Tynecastle yesterday. 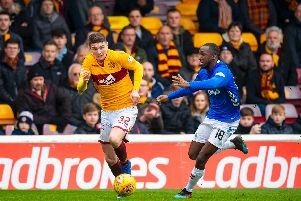 Today’s Premiership match at home to Dundee comes too soon for the 23-year-old Turk, but, if he doesn’t make the squad for next weekend’s trip to Motherwell, he is likely to be back for the home game against Inverness in a fortnight. “We’ll look to try and get Alim a game for the 20s either next week or the following week, and then we’ll look to get him back in the team from there,” said head coach Robbie Neilson. The outlook is not so good for Ozturk’s injury-hit team-mate and house-mate, Soufian El Hassnaoui, who is now in a battle to return to action before Christmas. After suffering knee ligament damage in July, the Dutch-Moroccan striker was close to returning to action last month after working his way back to fitness and featuring for Hearts’ Under-20s. However, as revealed in the Evening News last week, El Hassnaoui, whose 18 months at Tynecastle have been plagued by injury, has now been hit by a groin problem. Neilson is not envisaging him being back in the fold until well into December. Hearts are confident of confirming new contracts for some key men imminently. Arnaud Djoum, whose deal expires in January, and Osman Sow, Miguel Pallardo and Igor Rossi, who are contracted until the end of the season, are among those the club are keen to tie down.